What motivated you to enter the contest? My Dad, who is a long time reader of Luann Comics saw the contest. He took an interest in the contest and suggested I enter the contest. He is a retired architect and artist (pencil drawings). I am a sewist who enjoys designing and sewing fashion garments. Before starting a design, I read recent excerpts of the comic strip, and learned that Toni was a firefighter–someone who didn’t want an overly fancy wedding ensemble. I knew the wedding gown needed to reflect those values. The blue bridesmaids dress as shown in the comic strip helped direct the process. 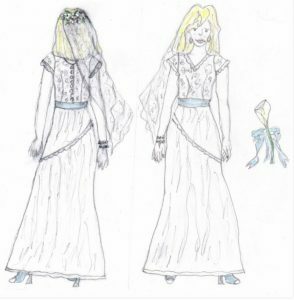 My thought was to create a bridal ensemble (2-piece outfit, skirt and top) while incorporating design elements from the bridesmaid dress, e.g., simple style, hip swag with white trim, light blue color, and V-neck. I envisioned the dirndl skirt to be made of 2 fabrics, chiffon as the top layer and lined with a lightweight satin. There is white lace trim on the hip swag on the skirt, with matching lace trim on the sleeves and neckline on the lined lace top (same trim as on bridesmaid dress). I pulled in the light blue with the colored blue waistband, blue heeled pumps and blue ribbon on the simple floral bouquet. I especially enjoyed the opportunity to draw “Toni” modeling my bridal design during her trip to the bridal store to say “Yes to the Dress”. Share a little info about yourself: your aspirations, your occupation, etc.